I post this recipe before for JMonkey, you can see it here. 1 Tablespoon honey or sugar . 2 1\2 cup warm water. 1 1\2 cups whole wheat flour. 1)Preheat the oven to 550 degrees. 2)Combine yeast,honey and 1\2 cup water in bowl,cover,stand in warm place about 10 minutes or until mixture is frothy. 3)place all ingredients + yeast mixture in the bowl of mixer ,beat 10 minutes to make a soft dough. 4)Divide dough into 12 pieces. 5)Shape each piece into a ball .cover,let rise in warm place until doubled in size ,about 1 hour. 6)Roll each to a 16 cm round. 7)The old method i bake Pita Bread on hot baking surface for 1 minute per side. 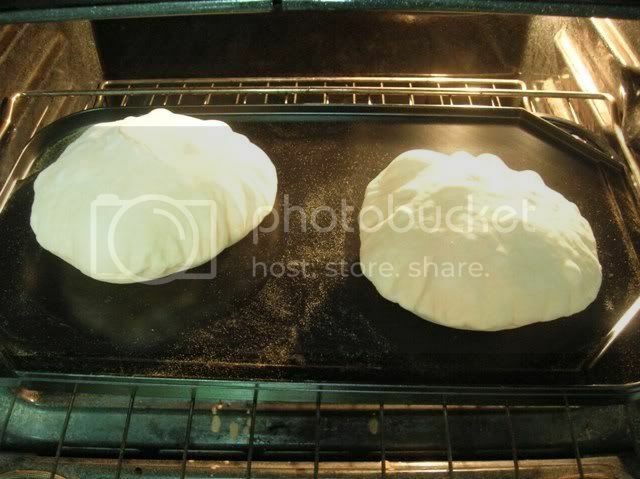 8)The new method I bake pita bread on wire rack over baking pan for 2-3 minutes.you can see it here. I just got home from work and I would be perfectly content to sit down to the table in your photo and have it be my supper. Lovely Pita - Very nice photos. how hot is your oven/baking surface? 550 F degrees oven . 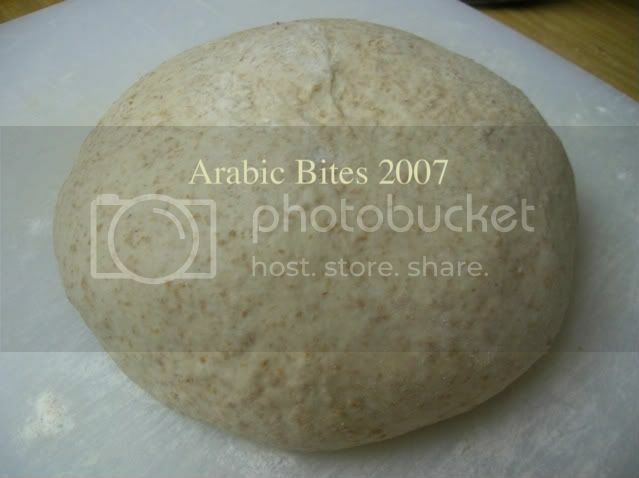 My wife and I learned to eat this in Egypt for breakfast. We add a bit of honey to the cheese. We are able to buy Syrian/Egyptian Olives and Cheese here in Malaysia. We make the bread. Thanks so much Zainaba! They were easy to make once I figured out how to get them onto my stone. My finiky 14 y/o daughter as been eating them quite quickly. Yeah! Next time I am going to try to use my lefsa grill (Gets up to 500 degrees) with the lid on to make these. What is the best way to flip them without puncturing them? We use tongs to turn our pitas. That usually works and doesn't pierce them. These look great. Have you ever made mini pitas? They are about 4 inches across. I was wondering how long to bake them. Thank you all for your comments here,& sorry I didn't answer your questions. (Thanks Elizabeth for answering them). 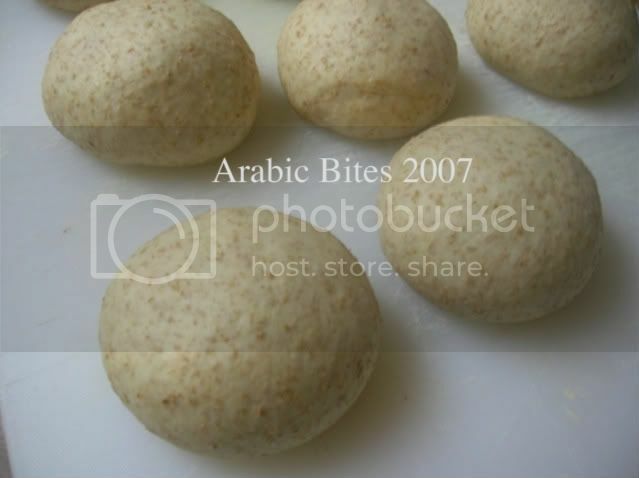 I didn't made mini pitas before ,but I think they don't take much time ,when they puffed you know they done. my whole wheat flour is very heavy so I use a lot of water. if the amount of water in my recipe don't work with you try to reduce the water to 2 cup & use 2 cups of whole wheat flour. also try to add the water gradually until you have soft dough. I think this will work ..